Converting your wardrobe from summer to fall (used to be known as: getting ready for back to school) is all about pulling in a few key pieces without covering up too much at once. The weather in NYC has gotten considerably cooler lately, although it looks like summer is going to give its last gasping breath later this week. Since I spend most of my days in an air-conditioned building looking longingly out the window, I tend to dress more for the weather in the evenings when I'll be spending time outside. That means bringing back denim with slouchy tees gauzy tops, or pulling a blazer over summer dresses. Sleek gold accents make any look polished, like a classic gold chain necklace or metal hardware on your shoes & bags. 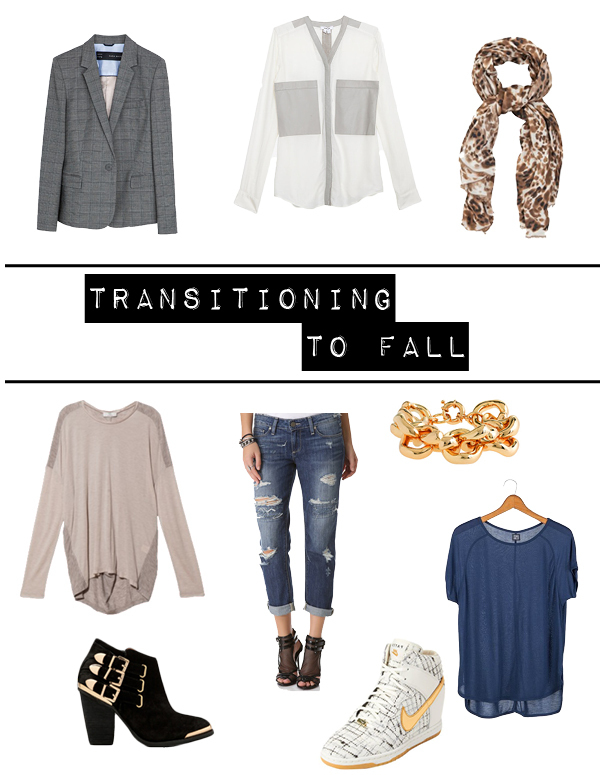 I am so pumped for fall clothing, love all your picks!